Super Megafest is pleased to announce R.W. Martin as a guest cosplayer! R.W. 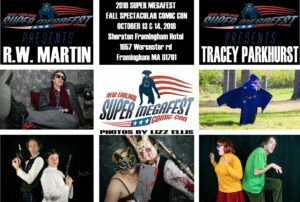 Martin is a New England based cosplayer most well-known for such characters as Murdock from The A-Team, Sheriff Rosco P Coltrane, Bert from Mary Poppins, MacGyver , Jon Baker (CHP Officer from CHiP’s) and of course the always recognizable, Ernest P. Worrell, just name a few. Raised in Vermont, he grew up with all the Classics, Star Trek, A-Team, CHiP’s, Honeymooners, Batman, and so many more. His cosplay choices reflect some of his favorite movies and TV shows. Although new to the comic con circuit, starting in 2014, he is no stranger to acting, or cosplaying, and has been doing both since 1986, starting with Weird Al. In the past he has been Ace Ventura, Fire Marshall Bill and The Riddler, Elwood Blues, Elvis, Indiana Jones, Obi-Wan Kenobi, TAYLOR (from Planet of the Apes), and Snake Plissken, just to name a few. R.W.’s goal is the cosplaying world is to bring joy and laughter to the fans of the characters he portrays. He is always looking for the next unique character to bring to life.